Info: Dieses Tutorial ist zwar auf englisch. Aber wir wollten es euch trotzdem nicht vorenthalten. 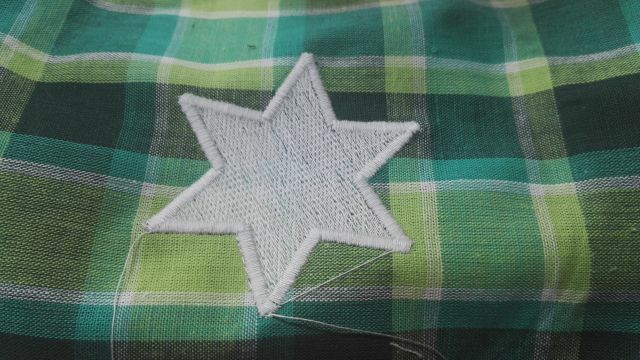 Simple straight stitch is only thing we need, so keep it simple. It must be domestic, no walking foot or anything that sort of “helping” movement, we don’t need that. Cast iron body, assures there is not any flex and wind wont fly it away. Fabric can become really tight when plenty of sewing is being made on single spot. Iron body makes it easier to swap more suitable stepping motor. With older sewing machine there is not that many parts to go wrong and old singer types are dirt cheap, if not, just find another. 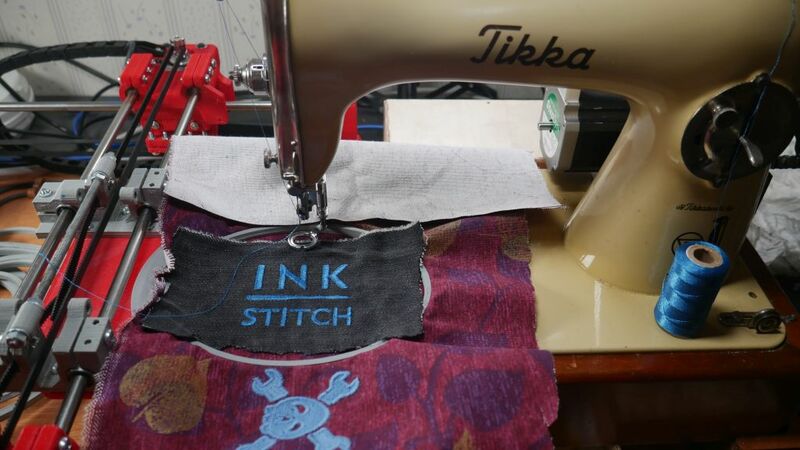 Before starting any modifications make sure sewing machine is fully working condition, use new thin needle and fabric and make long enough run. It is way easier to ditch than fix on this stage. If sewing machine needs some sort of uncommon needle, I recommend to get another one. Pressing foot, you need one and specially designed to embroidery. If fabric rises with needle, entire stitch is lost, outcome is nothing that we like, this is of course a problem that my machine had. There are 4 types of pressing foots available nearly everywhere. I have tested these and only one is good, not actually, but it will do on start. Embroidery pressing foot is special because it rises every time when needle is up most location. Normal foot would drag fabric badly. This is best what comes to end result, but lack movement. Sliding hoop under this foot is tight fit. As seen on image above, lifting arm is stuffed with shrink wrap by me to maximise movement. It would make sense to have round hole for needle and thread. This is made for other methods, but it is still the best. Needle hole is way too big, this results as same as not having foot at all (nearly). Can be fixed with some plastic piece and tinkering. Movement arm can brake, lower stop pin is too long. Same as above, but worse, open loop can catch looping thread. Nothing to do with embroidery, movement is minimal and weak plastic spring. This might be the one that can be improved greatly in the future. None of above are that good, but those are the options. I have ordered a few types more, but not yet any experience on those. 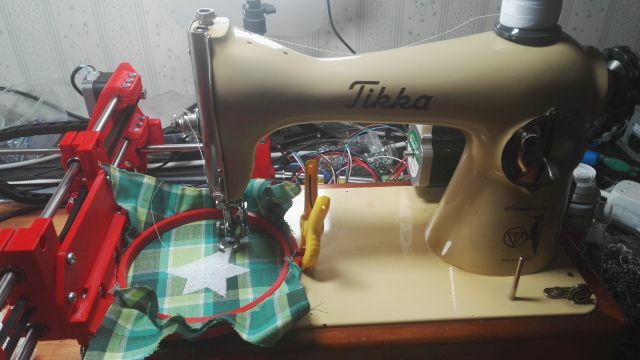 My sewing machine is branded as Tikka, but it is basically same as all the others on same era that being machines from1950, Singer 15-91 is exact match. Tikka is made at the same factory as famous Suomi KP/-31 (Suomi-konepistooli or “Finland-submachine gun”). Upper thread tension spring or complete housing might need attention. On My Tikka original spring is way too stiff, but a million and one spring assortment box will help on this. It is good to take it apart and clean anyway. Irregular thread tensioning will cause havoc. 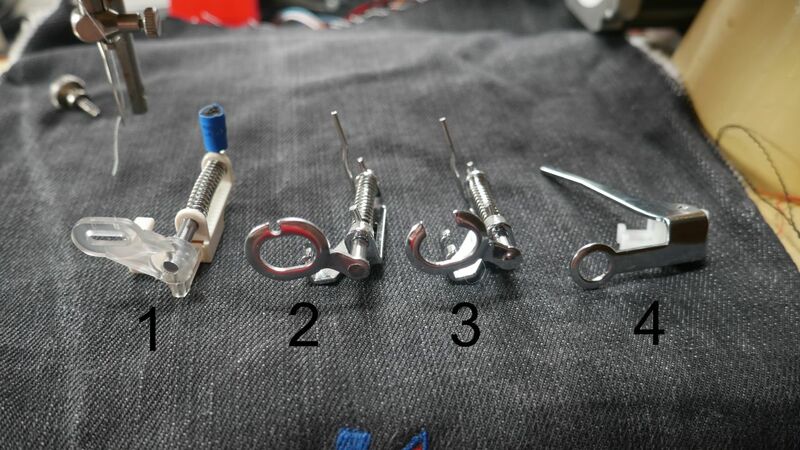 Bobbins, just make sure you have enough of them and something to wind thread to them, because after modifications bobbing winder is not working any more. Commonly black or white thread is used on bobbins, but if thread tension is problem, same colour on both sides will help. 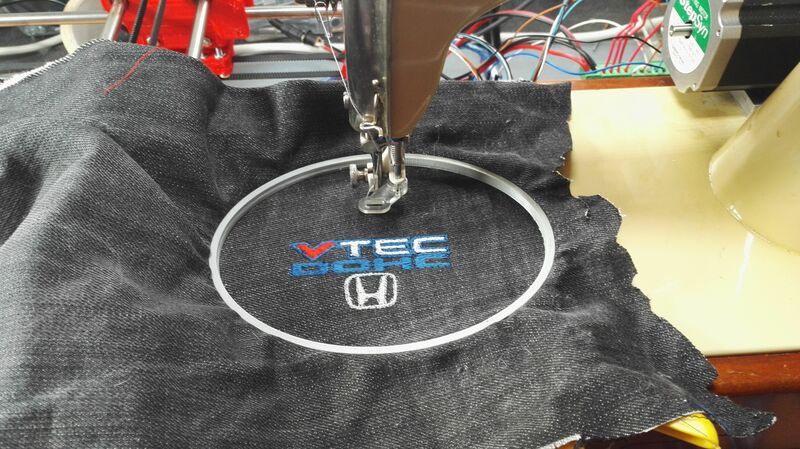 Thin oil or gun oil, make sure sewing machine is oiled well, but don’t over do it. One drop of oil every oiling location will do, if flooded wipe it away. Fabric, thread and dust will collect on excess oil and that is no good. 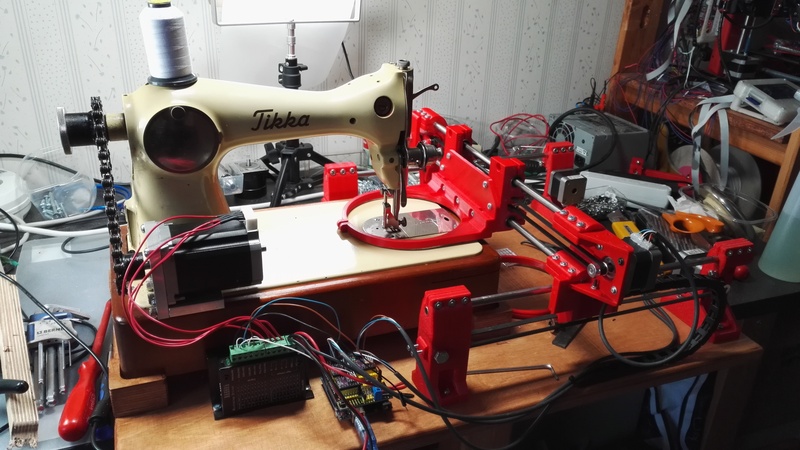 Building embroidery machine is relative simple procedure, just download 3D models to print and buy few screws counted on BOM. 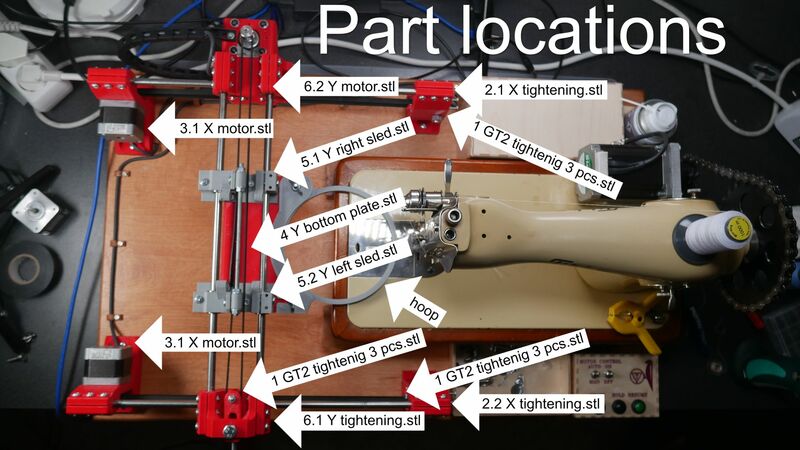 This is really simple for those that have already build their own 3D printer, this is actually simpler and at the same time includes a lot of same parts. Videos should cover mostly everything mechanical, there is small BOM text, but it is not that complete. Important note would be to not over tight, there are plenty of screws to not have to over tight, because printed parts are fragile! Assemble first everything finger tight and after everything is mounted on plywood and still everything moves freely, start tightening gently. After everything is tight enough, do not over do it, both axes should move easily. This helps machine movements and endures longer lifetime. I have noted when doing assemblies like Y axis, it might be tight at first, but after 24 hours or so plastic gives up some, so if Y axis is tight, wait a few hours. If this doesn’t help, then it is time to do something. I did a dramatic thing and heated up Y slide to make it perfect, it was because of poor printing, but it can be fixed. After everything is right, it is time to add GT2 belts and make them tight. I have to say again, do not over do it. Not included this on my videos, but it should be straight forward to do. Connecting Stepper driver TB6600 to GRBL shield. 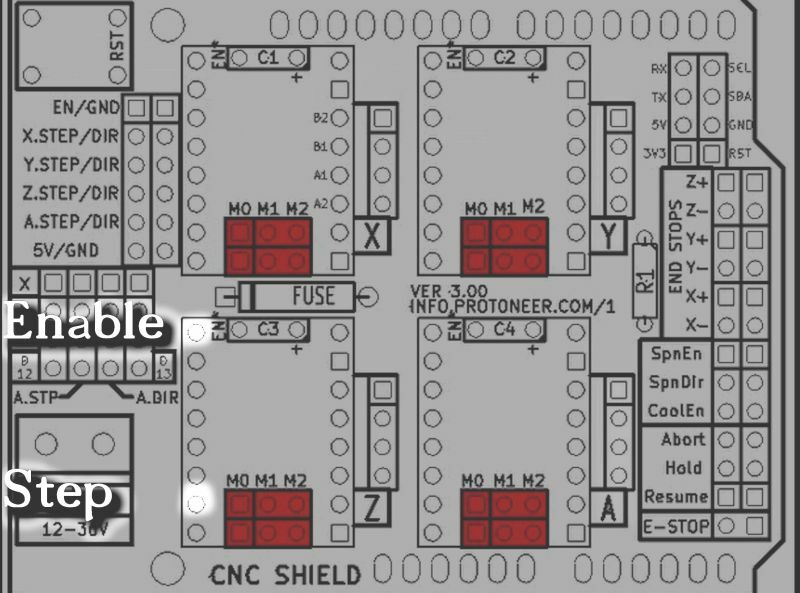 +5V and GND can be taken from shield. This looks more complicated than it really is. 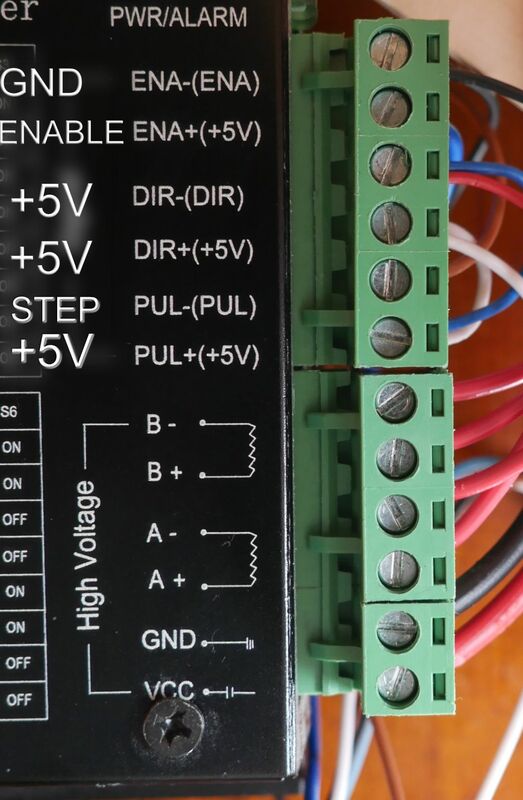 After compiling GRBL, you need something to control Arduino, my recommendation is GRBL panel, but there are many others. I feel this is the most user-friendly with minimal extensions to confuse you. 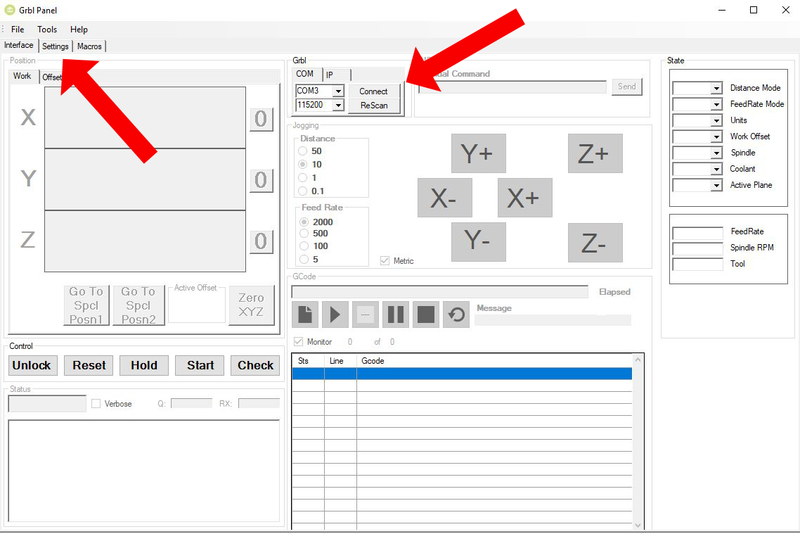 Connect to Arduino/GRBL and go to settings tab. Something similar should be visible on left hand side. GRBL wiki will explain every function, you can change every value. $20 and $21 change to FALSE, this will allow machine to move without home location. 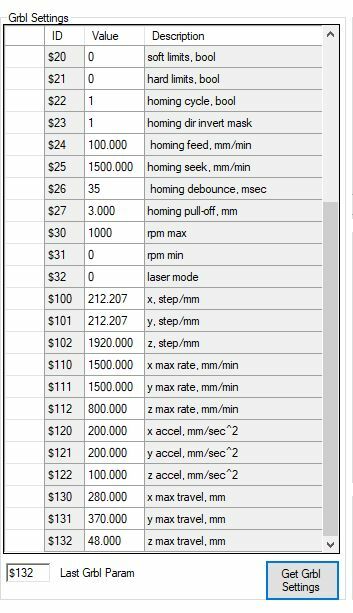 $102 this is sewing machine increment, number must be calculated for different stepper motors and gearings. Overall full rotation distance must be between 2 and 10. $110 and $111 Max feed, can be adjusted, this is very safe speed to start. $112 Z max feed, must be test separately. $120 and $130 XY acceleration, very average speed. $130 Z acceleration, must be test what works. These are only ones that are important, recommend to read setups for $0-$4 just in case some of those help for movement directions. Gear and belt for machine Timing belt or chain, to keep machine on sync. Special note for driving stepper: not having plans for attaching sewing machine stepper or drive pulley system. I have used Sanyo Denki Stepping Motor Step Syn 103H7823-0715 DC3A 1.8/STEP can’t find suitable documentation for it. But I can say much more bigger is needed, currently stepper is geared down 3:1 to keep it working constantly. When something goes horribly wrong it will stall, actually this is good thing. Eventually I will update motor or double the voltage. Sprocket I have used are self made from another project, so dimensions from them will not help anybody else. I would greatly recommend driving stepper with closed loop operation. If stalled, it will recover and should be possible to drive faster and reliable. Read the details on GitHub.